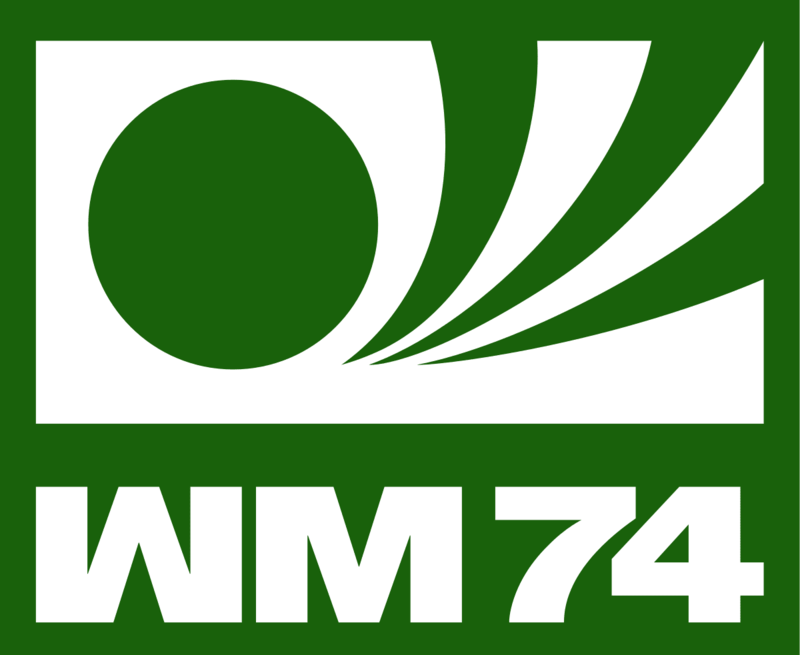 West Germany was chosen to host the tenth staging of the FIFA World Cup TM in 1974. Nine city stadiums were chosen to stage the games. The Olympiastadion (Munch), Olympiastadion (West Berlin), Neckarstadion (Stuttgart), Parkstadion (Gelsenkirchen), Rheinstadion (Düsseldorf), Waldstadion (Frankfurt), Volksparkstadion (Hamburg), Niedersachsenstadion (Hanover), and Westfalenstadion (Dortmund). Ninety-eight countries took part in the qualifying rounds with 16 teams making it to the finals. 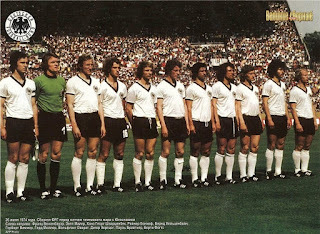 Hosts, West Germany and defending champions, Brazil were joined by Argentina, Chile, Uruguay, Bulgaria, Italy , Poland , Netherlands , Scotland , Sweden , and Yugoslavia . 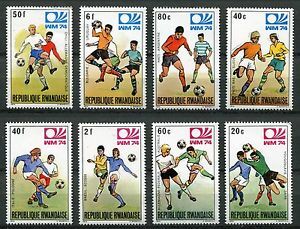 East Germany, Zaire , Australia , and Haiti qualified for the first time. 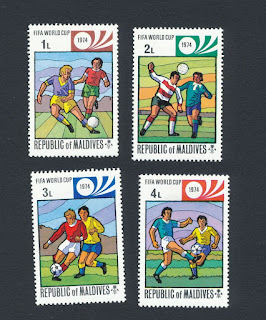 The final 16 were divided into four groups of four. Each played a round-robin with two points for a win and one for a draw, and goal difference used to separate teams level on points. The top two teams from each group advanced to the next stage. The second round consisted of another group stage: the eight remaining teams were divided into two groups of four. 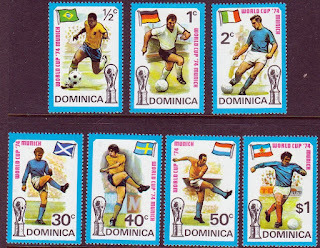 The winners of each group played each other in the final. The FIFA Organising Committee seeded the finalists into four and these were placed into the separate groups: Brazil (holders) and West Germany (Hosts) were joined by Italy and Uruguay. And the pots were completed by teams based on their geographical sections. 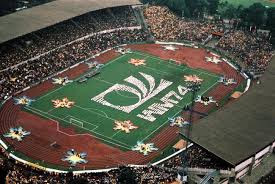 At the opening ceremony at the Waldstadion, Frankfurt, FIFA tried something different with adults in national dress, and a spectacle of collapsing balls. 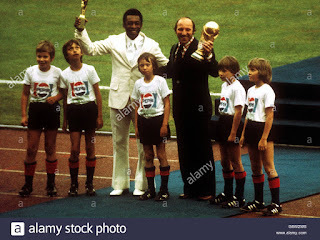 Former World Cup stars, Pele (Brazil), and Uwe Seeler, (West Germany}, appeared during the opening ceremony holding both the former and new world cups. 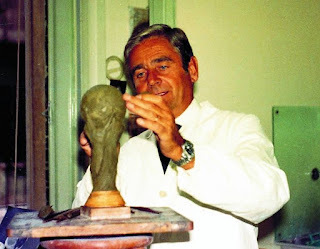 The new FIFA World Cup TM Trophy, was created by the Italian sculptor Silvio Gazzaniga. 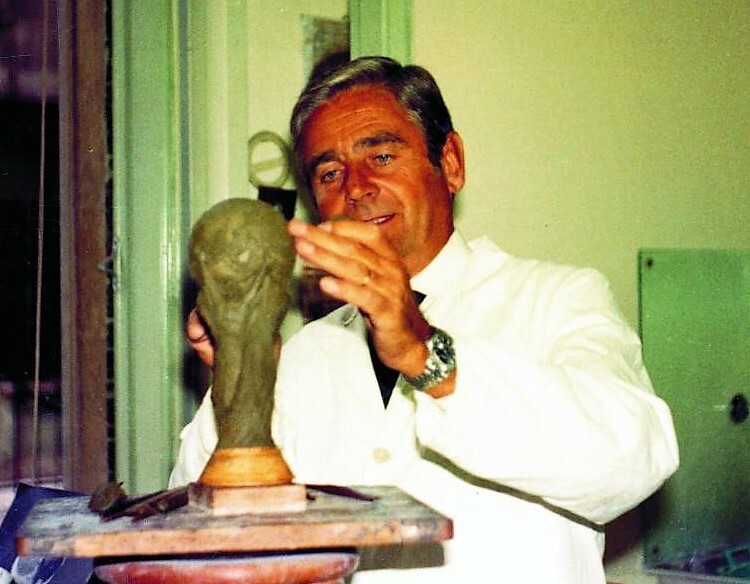 He created a plasticine model, a plaster model then it was finally cast in gold and officially adopted by FIFA in January 1972. 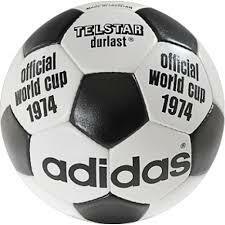 The official World Cup ball was again made by adidas and was the same as the previous competition ball with the old gold branding replaced with black branding to give it a slight change in appearance. The ball also had a polyurethane coating to give it extra waterproofing and protection. 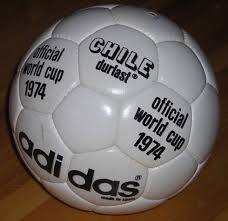 Two types were used in the tournament: the Telstar Durlast, and the completely white, Chile Durlast. 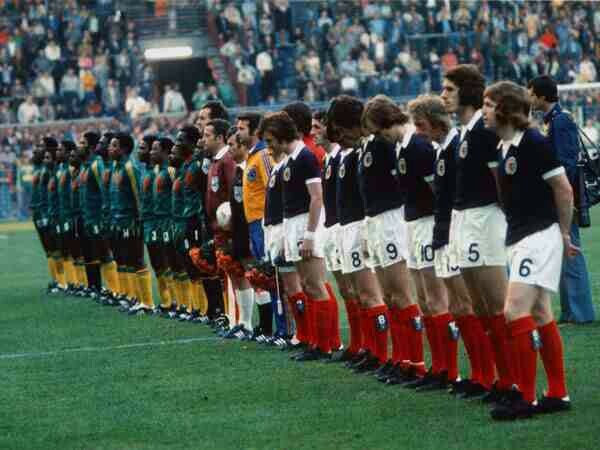 Scotland were the only team from the Home Nations to qualify for the 1974 FIFA World Cup TM. 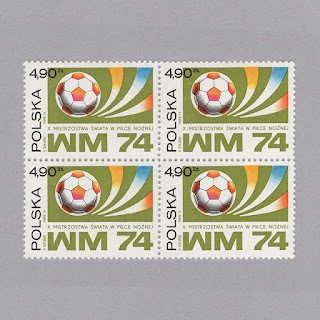 This was their second tournament (1958) and expectations were high. The team even recorded their own song. Sadly, despite playing well and not losing a single game, they failed to progress beyond the group stages on goal difference. Under the management of Willie Ormond , Scotland had a "gallant failure" and were the first ever country to be eliminated from a World Cup Finals without having lost a match. 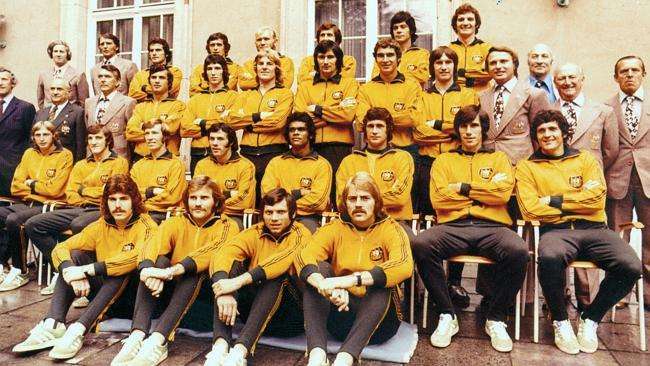 The Socceroos appeared for the first time representing Oceania Football Confederation (OFC). The team was made up entirely of amateurs and despite plucky performances failed to score in their group fixtures. 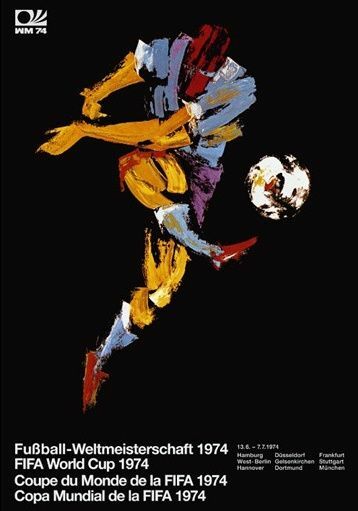 In the opening game of Group Four, Emmanuel Sanon (Haiti) shocked the world when he scored the first goal against Italy at the Olympiastadion in Munich. 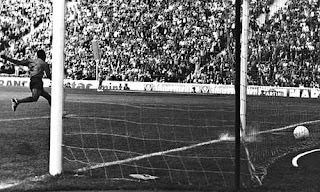 Until that time, Dino Zoff, (Italy) had kept a clean sheet for an incredable 1,142 minutes in international play. Italy finally beat Haiti 3 -1. Soon after the game Ernst Jean-Joseph (Haiti) became the first player to test positive for illegal substance in the World Cup. He was suspended from the rest of the tournament and sent home in disgrace. 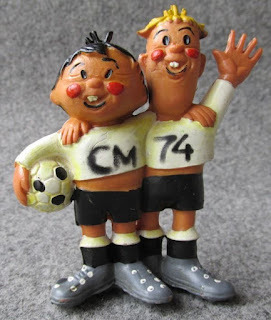 The official mascots for the 1974 FIFA World Cup TM were Tip and Tap, (two boys) wearing an outfit similar to West Germany's, with the letters WM (Weltmeisterschaft, World Cup) and number 74. 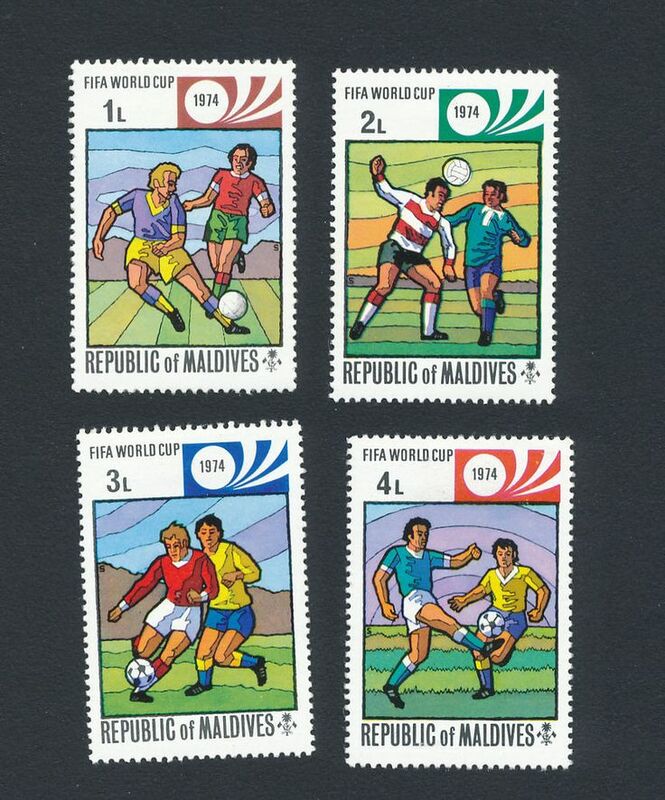 Many more countries issued sets of postal stamps to commemorate the soccer tournament. 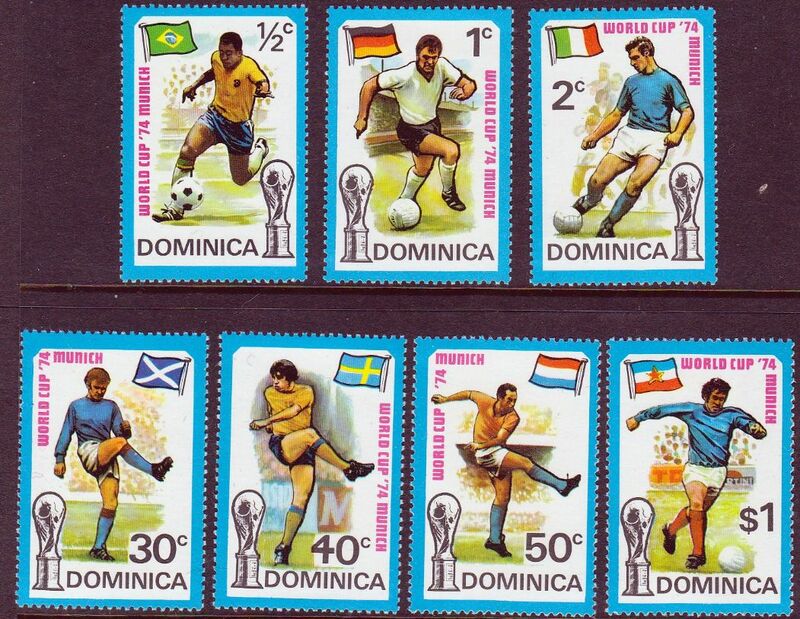 Panini released a 1974 World Cup Stiker collection and Album. 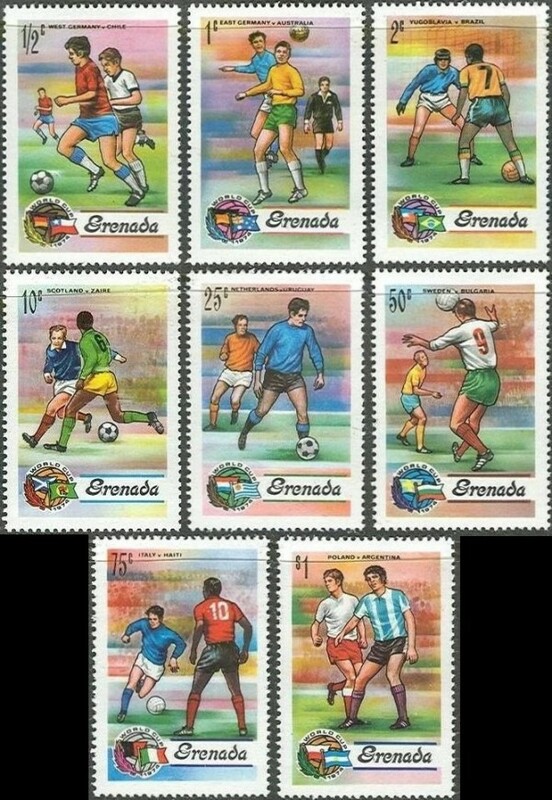 By the second round the Netherlands in Group A were on form with their "Total football" techniques. Total Football is a tactical theory where any outfield player can take over the role of any other player in a team. Early exponents of Total Football were European sides Ajax and Real Madrid, although the system saw trial in other parts of the world. In this fluid system, no outfield player is fixed in a predetermined role; anyone can successively play as an attacker, a midfielder and a defender. The only player who must stay in a specified position is the goalkeeper. The Netherlands and Brazil met after each had taken maximum points from their previous two matches. 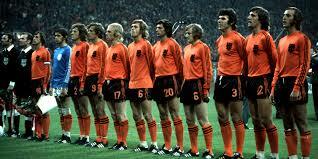 Two goals from the inspirational Johan Cruyff helped the Dutch side beat Brazil 2 -0 in a hard faught match. 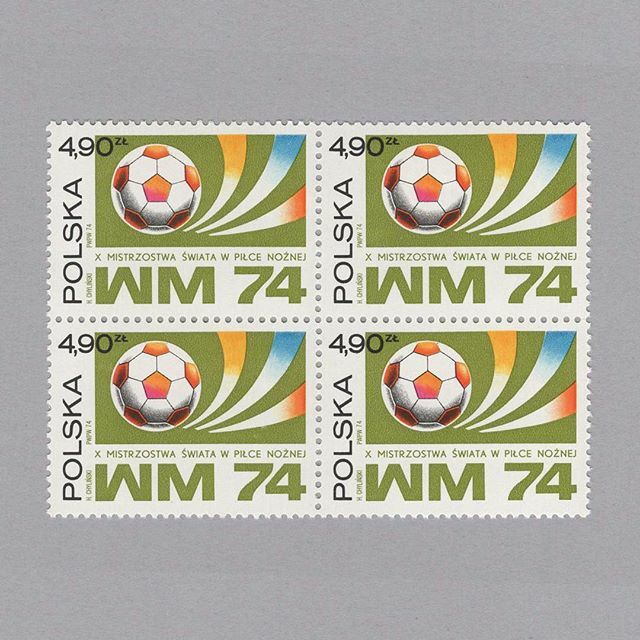 In Group B, West Germany and Poland met and a Gerd Muller goal send the hosts through 1–0, to the final. 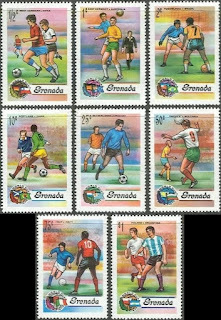 The tournament was held mostly in bad weather, and the stadia had few protected places. Despite this , 1,865,762 (average gate 68,991) went to see the games and ninety seven (97) goals were scored with an average of 2.6 per game. 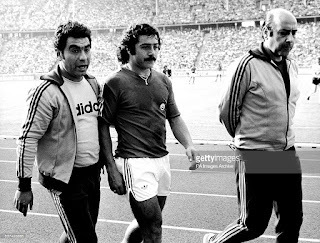 Carlos Caszely (Chile) became the first player to be sent off with a red card in a World Cup match, during their match against West Germany. Grzegorz Lato (Poland) was the top scorer with 7 goals. 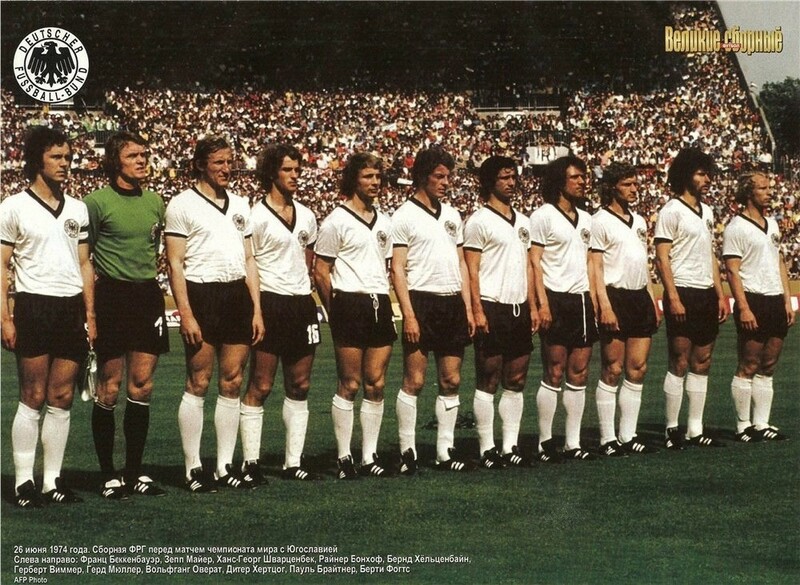 The final between Holland and West Germany was held at Olympiastadion, Munich in front of 75,200 spectators. 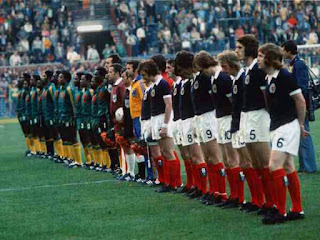 The start of the game was delayed when the referee, Jack Taylor found all the corner and centre-line flag-posts were missing as the teams lined up for the kick-off. The officials had forgotten to put the flags back in after the opening ceremony. From the opening kick- off, The Netherlands had Germany running ragged and in the first few minutes Germany scarcely touched the ball and Dutch were up 1-0 after only two minutes. Led by captain, Johan Cruyff the Dutch toyed with their opponents, making them chase the ball in vain, and mocking the Germans with their slick passes and insolent possession, Beckenbauer was determined not to be intimidated and marshalled his team to fight back. 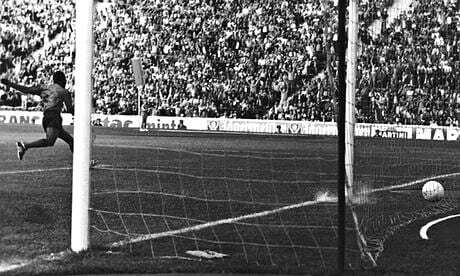 In the 25th minute Germany were awarded a penalty and Paul Breitner drilled the ball past Jan Jongbloed. 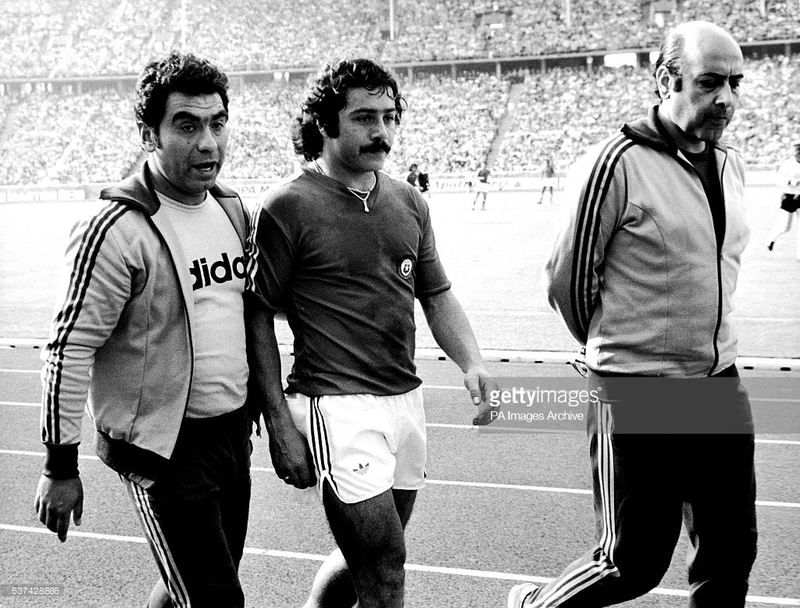 Two minutes before halftime, Gerd Muller scored for the winner for Germany. 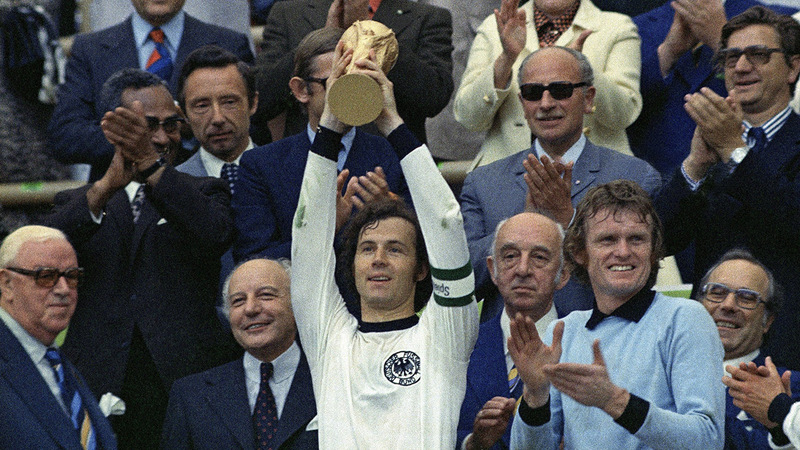 Franz Beckenbauer lifted the new World Cup trophy.